When looking for things to do as a couple during the weekends, for when the weather isn't so great outside or just a new experience for you and your family to enjoy, Birmingham's Sea Life Centre should be on your list. The centre is located alongside Birmingham's Canal, with some great restaurants surrounding it should you want to have a bite to eat after your visit. The National Sea Life Centre gives the opportunity to experience the ultimate underwater discovery, housing over 2,000 creatures in more than 60 displays and the added extra of UK's only 360° tunnel. The centre enables you to get up and close to some of the world's best underwater creatures; the Giant Green Sea Turtle, Lobsters, Sharks, Sting Rays and Otters to name a few. There's also an array of gorgeous colours and vibrancy in their vast variety of fish in all shapes and sizes. Around every corner is a different creature to see and discover about, the fact sheets spread around the sea life centre are great for some knowledge. Just recently the Sea Life Centre announced the new addition to their Gentoo penguin colony with the arrival of their very first rare Gentoo penguin chick. It's parents have flown from opposite ends of the earth to find love in the Midlands, it's a very cute addition to the colony. Another new exhibit in the centre is the Octopus Hideout, an opportunity to see up close some of the world's most intelligent sea creatures. Birmingham have a resident Giant Pacific Octopus, Beverley, one of the smartest sea creatures in the animal kingdom. This octopus is able to solve puzzles and negotiate complex mazes. The octopus is also a true master of disguise, blending with ease into their surroundings and can hide in the smallest of places. You can see all the children gaze around with curiosity and wonder at where the octopus could be! Just around the corner from the Octopus Hideout, be captivated and soothed by the pulsing movements of the jellyfish. Watch how lights illuminate their structure and movement, an interesting creature to watch. You can also sit back for 20 minutes and enjoy their 4D cinema, experience the smells, sounds and even a bit of a splash! The experience itself takes around 90 minutes or so to work your way through, however there is activities available for children which definitely means you could spend a couple of hours there. The 360° tunnel, the UK’s only tunnel like it is the perfect finale of the experience, watch the various creatures move around you as you walk through. Be captivated by the fluidity of the creatures; from stingrays, sharks, turtle and many fish. There is really a lot to take in and enjoy whilst visiting Birmingham’s Sea Life Centre. I was captivated and impressed for their variety of creatures all under one roof only 45 minutes from where I live in Leicester. It was good fun reading up on the various facts around the venue, getting up close to the many creatures it has and be sheltered from the rain outside for a couple of hours, whilst doing something fun and interesting at the same time. 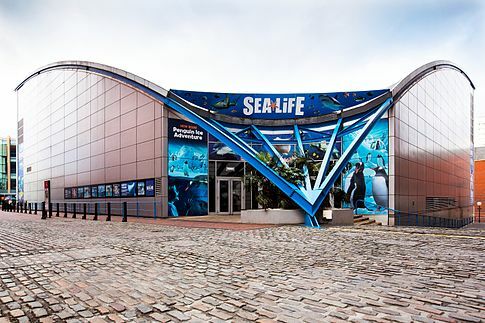 You can find out more about Birmingham’s Sea Life centre, with information on prices and times by heading over to their website here. *Complimentary Ticket. All photos and views are my own. I love going to the aquarium! I haven't been to the Birmingham one, but I loved the London one, and the smaller one here in Auckland, New Zealand is pretty fun too!